On a whim I posted something on Instagram the night of the football game, but in hindsight, I wonder if my caption implies something that isn’t the whole truth. My caption implies, or actually states out loud, that I was abandoned by the rest of the family on a night when many families get together with friends to have a party, of sorts. In fact, this is not the whole truth. You see, Sunday evenings are busy in this household. The girl child has a 2-hour baseball practice at a local gym (it’s off-season training), and my partner has shinny around the same time, a hockey game with a bunch of local dads at an outdoor rink here in the neighbourhood. They both leave around the dinner hour, which coincided with the football game starting. I dropped off the girl and got back before kickoff, to a teenager plugged into his phone chatting with friends. He asked me about the chicken bites, so I put some in the oven and sat down beside him. I half listened to his chatter with his friends but I kept an eye on my phone, reading random stuff while watching the game in front of me. After a while, he went downstairs, probably to plug into fortnite or whatever. It sounded like he was on group chat, I’m sure that’s what they ended up doing. That’s when I posted the picture. And called it abandonment. But here I am this morning, thinking about this whole comfort zone business I mentioned the other day. My mind keeps going back to the whole abandonment issue. Why did I feel abandoned? Or, if I didn’t feel it, why did I say it? Am I trying to evoke a response from the internet? Alternately, is the feeling of [ implied ] abandonment, which leads to a desired solitude (for me, often), part of the comfort zone I find myself trying to push beyond? Here’s the strange thing: I don’t mind being alone. I often choose it, too. But that doesn’t mean I don’t enjoy socializing. I do. I just don’t do it very often. When life is busy and all about obligations and kids and chores, one tends to crave the solitude that comes so rarely, no? Tell me the truth…are there times when everything is finally done, you find yourself choosing the alone option over the bonding option with someone? Choosing a corner away from them to be alone with your thoughts, as a way of recharging? I appreciate all the comments that came back on yesterday’s post, but if you come here waiting for me to give you answers, I am sorry to disappoint you. Which shouldn’t stop you from contributing. Please do, if you have something to share. I seem to spend most of my time building escape routes from life, which I suppose is the exact opposite of what you’re describing here. It is a sad affair. We are individuals, not family oriented\pack mammals. Yet, we go against nature and contract bind ourselves to another(s) not just the partner, but our offspring. Being animals, we still relish the hunt. (that explains the worlds fascination with social media and romance apps and just why most relationiships end, not with death, but by deceit) I have always felt alone trough life, since childhood thru adulthood. Only time in life my lonelineless placated, was alas, when I indulged the inner wolf. I dont crave the freedom (too much) but only that feeling of acomplishment, and those initial steps in the foolishness of romance, the only way I found in life to deceive loneliness. We evolved and settled, but deep inside us the hunt endures. Interesting perspective. Thank you for sharing it here. It’s the feeling of being alone, nothing to worry about. It’s the same feeling you will have when they are grown and moved out of the house. Okay this is going to be hard to explain … I love having my family around the house active with noises but then I love my own time alone reading writing etc.. then when there is that moment where everyone is out and about and here I sit and I too feel abandoned . I think it’s a mom thing .. we want are family around but then want some quiet time then get it and it’s an awkward thing … I hope this made sense ? I like it when they’re not here but only for so long…like you said, after a while I want them back. But not too long…lol. Crazy, us moms! Yes you understood and you explained it perfect . Exactly it lol Crazy hmm nahh lol let me just say as they become adults it’s the same feeling always a mom . Don’t be too hard on yourself I think your a great mom. I totally get the “alone” thing. I feel it even without having kids’ demands on my time. At other times, I need to be with my friends and family. I think that’s normal. I’m a tad bit confused as to what the actual question or questions are. 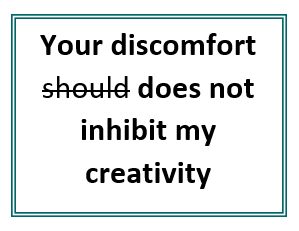 Earlier in the post you said you wanted to talk about comfort zones. I’m not sure how comfort zones ties in with getting stuck in a rut and how they both tie in with choosing alone time vs bonding. Alone time vs bonding – I live for alone time! Sometimes I feel guilty leaving my Mom in the living room alone to read her book or watch TV, but I don’t get a lot of alone time so I force myself to indulge now and then. I think it’s very important to have it. I enjoy my alone time and find it productive. You are not alone. Sometimes I crave a secret room where I can rent for the month and hide away and write. I think it may be a parent thing. Much as I enjoy spending time with the kids, I do look forward to that moment when they are all in bed and I can sit back without anyone wanting my attention. I have probably always been a bit like this — needing time to myself — but it has become more noticeable with children because their activities tend to set the rhythm of the day/evening. I think the parent thing is a huge component. I’m not certain about whether it’s a female thing, but I told my husband two nights ago that I wanted a week off from everyone …and hurt his feelings. He thought I ought to want to spend a week off with him at least. Perhaps it’s an introvert thing? I feel overstimulated from everyone NEEDING me. I am not all up on the current “self-care” thing, but I think what you are describing is that. As a mom (you, not me) it is important to find time for yourself and recharge. Lots is asked of mothers and you can’t complete your “job” if you aren’t fully rested, recharged, etc. There should be no guilt, no shame, for taking care of you. Enjoy it! Self care is a whole thing these days, isn’t it…I think I do a decent enough job of it. Some days/weeks are worse, or better, than others. Thank you for your contribution.